Just for the record, the former Bell Island Ferry Users Committee Chair is now the Island's Progressive Conservative MHA. 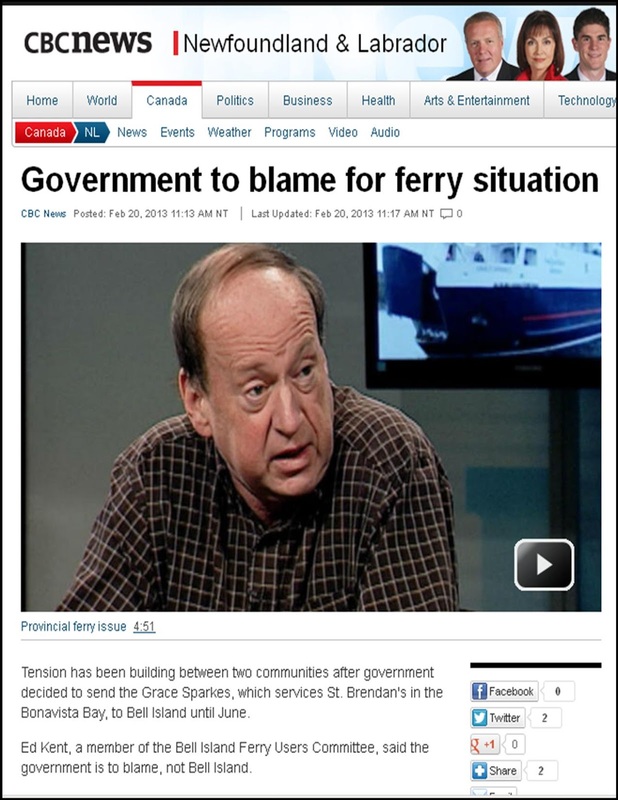 David Brazil has become the government's spokesperson for ferry schedule cuts and the chief apologist for mechanical issues with the aging vessels used on the Tickle. 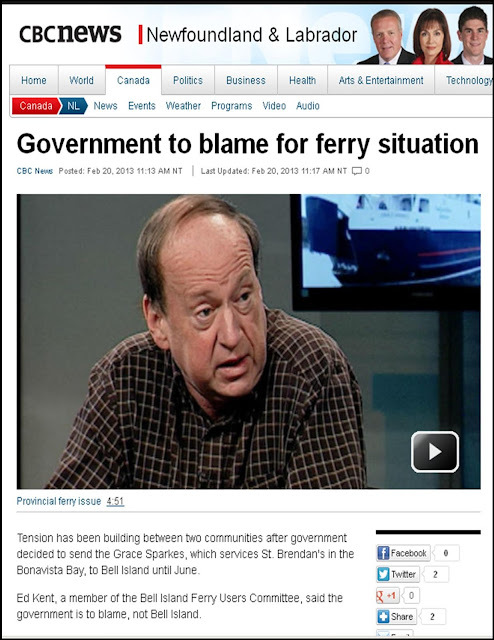 One passenger on the ferry told me last week that the local member is as "useless as tats on the Bull he spews"
The MHA for Conception Bay East-Bell Island was in the media defending the reassignment of the MV Grace Sparks from St. Brendan's to the Bell Island Run. While speaking to VOCM News, he took the opportunity to state that he feels "confident he will be exonerated" of any wrongdoing in an on-going RCMP following an investigation into his involvement in the delivery of the Adult Basic Education Program on Bell Island. The government launched a review in September 2012 after Liberal MHA Yvonne Jones complained and asked why Tory MHA David Brazil was involved in the program. Advanced Education and Skills Minister Joan Shea handed the matter over to the police following an said an internal review. For his sake I hope the courts and the police feel he has more credibility on that issue than his government does on the ferry issue.